Name/brand of white wall tiles please? - Congratulations on a gorgeous bathroom! Could you please tell me what the name/brand is of those fabulous white wall tiles and where you sourced them from? Thank you. Lovely bathroom - Love the vanity. Was it custom built? Thank you! Yes, we designed this custom vanity and had it constructed by Williams Cabinets. You can see their Houzz profile here. name/brand of bathroom floor tiles? - name/brand of bathroom floor tiles? These tile are called Alchimia Grigio/Nero by Quintessenza and are available from Urban Edge Ceramics in Richmond, VIC. The toilet as a good luck charmIn Japan, it’s said that keeping the toilet clean can bring good fortune. This is allegedly inspired by Zen Buddhism, as cleaning is regarded as part of its practice, and the feng shui tradition. In addition, according to feng shui, the toilet is governed by the element of Water, associated with wealth and cashflow, so it is important to keep the toilet clean. According to Junko Kawakami, editor of Houzz Japan, linking a clean toilet to good fortune, and perhaps an even greater love of the toilet scrubber, has existed in Japan for many years. A comparative survey conducted by Lion, one of Japan’s leading manufacturers of detergent, soap, hygiene products and other toiletries, 42 per cent of the group of people who answered that they keep their toilet clean also said they have luck with money. Conversely, only 22 per cent of the group of people who answered that they didn’t keep their toilet clean said they felt they had luck with money.In addition, the average annual income of the people who keep their toilet clean was 5.42 million yen, while that of the group of the people who don’t was 4.54 million yen. 1. Tinker with the toiletMany decorators will have ideas about how to create the illusion of space in a small room or house, but the trick is to actually free up space. And most of the time, the busiest and most-used rooms in the house – the bathroom, laundry and kitchen – are the best rooms to start with.If you find your fixtures take up too much space, slim them down or get rid of them altogether. A wall-hung toilet with a concealed cistern, for example, saves precious capacity in the smallest room in the house. The cistern sits in the wall and the buttons and pan are all you can see. Be aware though that concealed cisterns can pose an access problem for your plumber and one day that cistern will need maintenance and eventually, replacement.Pro tips: Hide an access panel, or position the cistern where the wall it backs onto is a wardrobe or cupboard, and only buy well-known brands so replacement parts are easily found. Decorative tilesPorcelain tiles can be used as a decorative feature in bathrooms and kitchens on floors, walls and splashbacks. 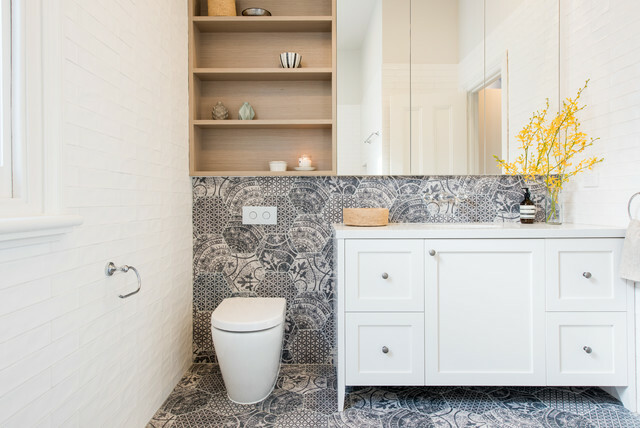 These glazed porcelain tiles have a patchwork of motifs that add pattern, dimension and shape to the bathroom wall and floor.